Train delays in India are no longer funny! The track record below shows an average 20% increase in delays in the last 2 years and the numbers are only increasing. This RailYatri report brings forth a data centric approach to slice and dice the performance of trains across India and perhaps a first step towards finding a solution. What is RailYatri “National Train Delay Index”? RailYatri’s National Train Delay Index is the cumulative national average of delays in arrival of train at a station on its route. It is important to point out here that we have considered all the stations across country to calculate this index. This is different from the practice which Railways across the world wherein only the delay at the last station is considered to calculate the delay index. We believe that considering all the stations makes it more ‘consumer’ centric. The data based on ‘crowd-sourcing’ is collected by the travellers reporting through their mobile devices. How frequently does RailYatri calculate “National Train Delay Index”? 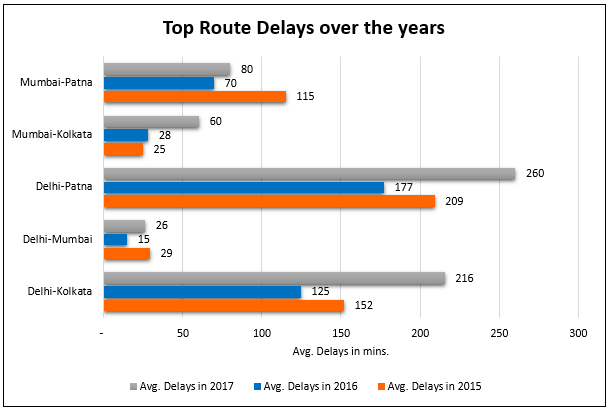 While internally we keep track of train delays on an on-going basis, we publish the comprehensive delay report at the end of the year. As an example – the report below is for the past entire year 2017. How accurate is the data used to calculate the delay index? Once accumulated through crowd-sourcing, the data goes through rigorous cleansing algorithms which separates the ‘good data’ from the ‘bad data’. Based on the rigor which has gone into building these algorithms, today after 4 years of continuing to publish this report, we remain very confident of the data which we have. To get the correct picture of the delay index, we have used the data only between January 15 to December 15 (11 months). The severe train delays during the period of December 15 – January 15 due to fog in the northern India tends to skew the year-wide delay index. So we publish the delay data during this fog month separately from the remaining 11 months. Why publish “National Train Delay Index”? Something which regularly affects the lives of the citizens of the country have an index to easily figure out if that particular ‘thing’ is on the rise, holding steady or reducing (which could be good or bad based on what is being measured). For example there are already indexes to measure happiness, pollution, crime, etc. Needless to say train delays, which is a very common problem associated with trains in India, adversely affects travellers like us. So it was important to start calibrating the severity of delays and then keep track of it over the years. It was equally important to look at this data by slicing and dicing it through various dimensions to see the impact of it. With this background, RailYatri has been crunching the delay data and publishing the findings over the last few years. Check what RailYatri's NATIONAL TRAIN DELAY INDEX has to say about 2017 delays! Delay index has been calculated based on the data between January 15 till December 15 of the respective year. Top 10 STATIONS In India with maximum/minimum delays. Check them out here. Stations having stops of more than 50 unique trains per week have been considered for the top 10 lists. It is important to note here that the National Train Delay Index for 2017 stands at 53 mins. Stations from Uttar Pradesh and Bihar come in the top 25 stations with the maximum delays. PHAGWARA JN (PGW) from Punjab is the first station from the third state which comes at 38th number with worst delays. Gujarat is the BEST PERFORMING state, Bihar the worst. Check your state’s Train Delay Index. State-wise Train Delay Index. Bihar continues to have the highest delays. Gujarat has the lowest. Bihar continues to the state where travellers continue to face the maximum delays. At the current rate of increase, it is well possible that the average delay at its stations may cross 2 hrs in few years. 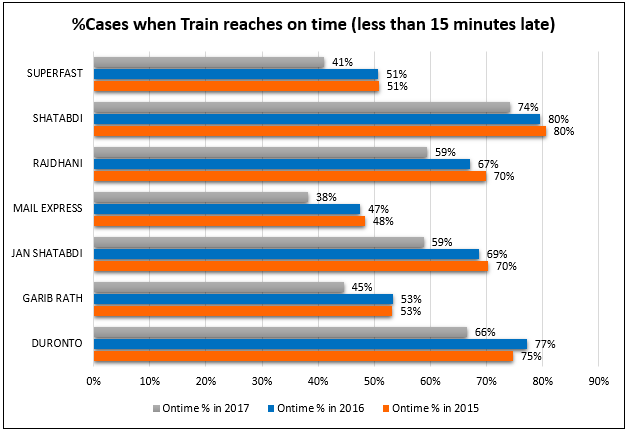 Three states – Uttarakhand, Bihar and Kerala – are showing a double digit percentage increase in train delays consecutively over the last two years. In terms of percentage increase in train delays in 2017 – the state of Orissa and Gujarat saw the maximum increase (nearly 28%). However, considering the low average delays in Gujarat, this impact of increase is minimal. In terms of percentage decrease in train delays in 2017 – the state of Punjab and Delhi showed a decrease in delays (by nearly 1.5%). POPULAR CITIES/STATIONS in INDIA & their Train Delay Index! Check them out. Check out the Top 10 stations in India with IMPROVING track record! Stations having stops of more than 50 unique trains per week have been considered. Though Gujarat has shown an average improvement of 62%, the delays have increased in 2017 as compared to 2016. STATIONS which need ATTENTION! Delays are increasing! Though the delay in stations like Hubli are comparatively low, the trend of increasing delay needs attention. See how LATE/ON-TIME is your Rajdhani, Duronto, Shatabdi and Superfast trains. Did you know trains ON-TIME PERFORMANCE is best in August? For the month of January only the delays of dates between 15 and 31 were considered. For the month of December, the dates between 1 and 15 were considered. Delays are seen to increase starting from the month of October and lowers off post February. 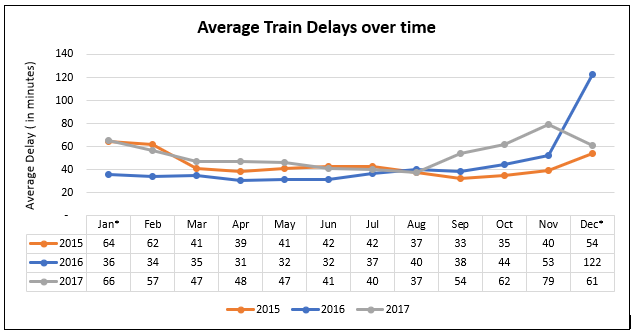 With an exception of December, every month on 2016 saw a decrease in delays compared to the respective months of the previous year. In 2017 – the train delays were across the year. Every month in 2017 saw an increase of delays of nearly 15-20% over the respective months of 2016. So, does delay increase during the rush period? Below were the dates on which the popular festivals fell in the last three years. FOG-DELAYS over the last 3years. 2017 worst in 3 years! Fog delays in 2017 has been the worst in the last three years. For the fog of 2014-15, the data between time-frame of Dec 15 – 31, 2014 was not available. So only 15 days data has been considered. Check out which is the BEST STATION in your state! In the following three states – even the station with lowest delay is higher than the National Train Delay Index – Assam, Bihar, and Punjab. WORST Performing trains in 2017. TOP 5 Rajdhani & Duronto with maximum delays. Check them out! 2017: Top 5 Rajdhani trains with maximum delays. 2017: Top 5 Duronto trains with maximum delays. POPULAR train routes across India & their Performance Report. Trains with OVER 1000kms run have a higher risk of getting late! Check your train here. Next time you sit in the train, remember - longer the train route distance, more are the delays! Nearly half of the long-distance trains in India run 1000 kms and higher. Only one-third of them arrive at the station on-time. However, for the trains which runs less than 1000 kms, the percentage of trains arriving on -time increases to nearly 50%. The chances of train running late by more than 60 mins nearly doubles when the running distance of the train (from start station to end) is more than 1000 kms. Do trains with MORE STOPPAGES have higher train delays? Is train delay a function of number of trains at a station? Do JUNCTION STATIONS have more train delays than non-junction stations? Is train delay a function of being a junction station?